Hundreds of foreign drivers caught by speed cameras have escaped fines in Leicestershire because motorists cannot be traced. Vehicles with foreign number plates only have to be registered here if they are used on UK roads for more than six months, so drivers cannot be located. 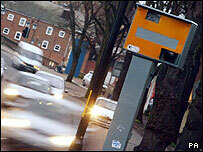 Leicestershire's camera partnership said 1,487 foreign vehicles were pictured speeding last year alone. Leicester MP Peter Soulsby is calling for better sharing of vehicle data. Fines of up to £90,000 could have been imposed on the foreign drivers caught speeding. The worst case was on the A1 near Oakham where a vehicle with foreign number plates was caught travelling at 121 mph. "People will be a little frustrated to see that a foreign driver is perhaps getting away with speeding because we can't trace them and they themselves may have drifted over the speed limit and been caught," said Hema Lad from the Leicestershire Safety Camera Partnership. Labour's Peter Soulsby said: "It just needs our computer system at the DVLA to be linked with similar systems in other European countries. "It needs them to talk to each other to exchange information and make sure these drivers that are breaking our laws pay our fines."